Arms: Argent on a cross Azure, a fleur-de-lis between four thistles slipped and leaved of the first. Crest: Issuant from a mount Vert a lily plant Proper with three Flowers thereon Argent seeded Proper. 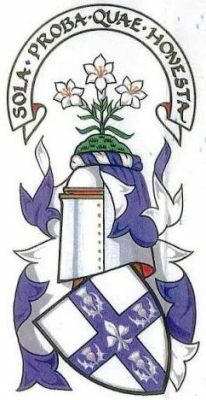 Grant: 4 February 1991 upon the 11th page of the 77th Volume of the Public Register of All Arms and Bearing in Scotland. SOURCE/NOTES & CREDITS: The blazon and some of the text are from the Letters patent. The balance of the text is adapted from the information supplied by the armiger. Philippe Marc Eugene Neve, Master of law of the University of Louvain was born in 1951 in Brussels, Belgium where he resides today. According to his family's tradition the family left Scotland in 1746 and took refuge on the continent. The armiger is a retired advocate and a member of the "Institute Saint Georges pour la Noblesse" and honorary member of the "Tudjeutil Breigh" the Association of the Nobility of Brittany, (France).